How can you spot somebody from Wiltshire when they are on holiday? The answer is simply by his or her car - and we are not talking about a 'I support Swindon Town' or a 'I love SwindonWeb' sticker in the back window! The giveaway is the car registration number which signifies which Vehicle Registration Office (VRO) the licence number was issued from. Although the DVLA at Swansea is the central control point for registration numbers, there are dozens of VROs around the country and, until a couple of years ago, one of them was in Swindon. All standard numbers issued before September 2001 are made up of a serial letter indicating the year of registration, a serial number between 20 and 998, a serial letter and finally a two-letter code denoting the VRO. If these last two letters are AM, HR, MR or MW, then the vehicle was probably - but not definitely - registered in Swindon. You can always tell where our Minis come from! Since September 2001, however, a new system for registrations has been in place where the first letter on the plate is now the indicator for which region the car was registered in. 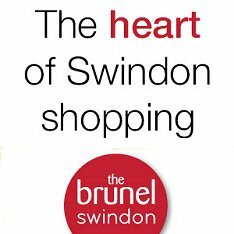 Unfortunately, with Swindon no longer having a VRO, most cars sold in Swindon have a Bristol (W) or Reading (R) letter assigned to them! 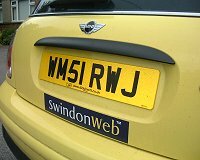 Rest assured, if you ever see a yellow Mini out on the road you will definitely be able to tell where it came from if it's one of ours - it'll have SwindonWeb plastered all over it! Since 1990, the DVLA has also been running a 'Select' system whereby car owners can request a specific combination of three letters on payment of a fee. Swindon numbers are therefore liable to be reserved by people living elsewhere - especially if they happen to be called Sam or Pam (A123SAM), or if they drive a BMW (A123BMW)! Before 1983, the two-character code signified the county or borough of registration - in our case, Wiltshire - but as Swindon was the only VRO in the county, for Swindon you can read Wiltshire. The codes that now apply to Swindon formerly applied to Wiltshire, with one exception. The code WV signified a car registered in Wiltshire before 1983, but is now issued by Brighton. By the way, 1983 was also the first year that the year of registration preceded the rest of the number (the previous format being SAM123A). Registration numbers have been issued since 1904 and, apart from the slight amendments listed above, the regional coding system has hardly changed.